create moving, changing melodies and effects.” 2.0 also features an extended song mode for arrangement. More is on the way in future versions, including a skinnable interface, and you can download Korg, Kurzweil, and LinnDrum drum kits. 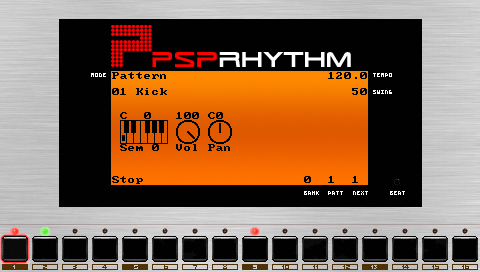 The interface is true to hardware drum machines, well-suited to the PSP’s design. These are features you’re unlikely ever to see in an official PSP game — bless the homebrew community! Now did anyone get a PSP over the holidays who can test this for us? Let me know.